Revolutionary Multi-Player with OCR for Books, Music, Documents, Podcasts, Recording, DAISY and More! We’ve created a 3-part video series introducing Blaze EZ, a new type of multi-media player for the blind. Get an introduction and orientation to the tactile buttons and other controls and then learn more about the many functions and uses of this versatile new tool for the blind. 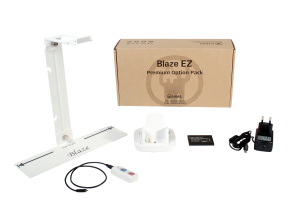 Be ready for anything and get even more from your Blaze EZ Multi-Player with the Blaze EZ Premium Options Pack. This accessories kit includes a sturdy stand for doing OCR captures, a charging cradle that charges the Blaze EZ along with a second battery at the same time, an extra battery and spare AC adapter.